SS: the “Queen Star” is a double star .. the above image is of Sirius A which is the brightest star in the night sky, and Sirius B is a white dwarf orbits Sirius A . can see the previous blog image that Sirius B is a x-ray source and nearly invisible . SS: in the skymap below there are two main regions of this alignment, the first being the comet outburst of ikeya-murakami that occurred just as it began to pass by saturn “ring of soul” .. as ikeya -murakami proceeded along it’s path it came to the ecliptic where it will encounter the moon on britney’s birthday.. you can see in the starmap below how close the moon will be to the comet and the links below it to see the “ring of soul” outburst . .
SS: this dec. 2nd alignment of britney’s birthday consists of moon and venus .. which venus is the astral light and the moon is it’s mirror, and also with saturn “ring of soul” .. comet holmes* and also schwassmann-wachmann which both spent all of this year in the beehive crown are also nearby. SS: the second part of the alignment is comet hartley (see links here) fell all the way from andromeda “Queen’s Soul”, past algol “Queens Eye” and reached all the way to Sirius “Queen Star” ISIS .. hartley is hovering around here in this region for weeks before heads out . .
SS: this image is the greek golden medallion artifact that says ISIS right on it click the image for closer view. the greek priestess trace back to the cult of amon-ra from egypt and were called the “Singers of Atum ” and “Enchantress of Atum” .. these were priestess who were goddess equivalent to pharoahs . SS: in egyptian myth ISIS or SOTHIS was the Queen of Egypt who wore the feather crown . she also has the wings of ISIS . in this image taken from the egyptian book of the dead we can see ISIS with the feather crown standing behind Osiris . this feathered crown brings to mind the south american myth of quetzecoatl . like the quetzal priestess, the ISIS priestess also has relationship with the polestar as found in the pyramid texts . SS: ISIS is a moon goddess and moon goddess is priestess queenBee . this is truth as proven by the discovery of schumann resonance, the astral light, and our latest physics theories . the isis queenStar is the priestess queenBee closed loop “scalar potential” and it is queenbee because it is an eclipsing binary system . SS: this caterpillar is interesting .. the reason i find it so interesting is because in the hive the hive souls always start out as larvae . when they grow we are looking for the queen and there is no way to actually detect the queen other than the methods that i have developed with my sciences.. beekeepers always mark the queen of the hive so they can be found easily amongst all the bees in the hive . Huemac of the Strong Hands (another name for Quetzalcoatl) the young god is Quetzalcoatl, the original comet figure who is also called Ehécatl, the god of the wind. Other natural elements found as attributes of Quetzalcoatl are: Son of White Cloud, Serpent, whirling wind and a strange element that states: “when he walked he shook fire from his sandals.” This was thought to be “emblematic of lightning.” However, except for the Dragon/Serpent that was the comet, serpents crawl actually craw; along the ground. SS: this is science data that needs to be archived . we can see here again that comets are a source of x-rays . well they are more than just a source of x-rays, they are also a source of “scalar” activity .. i have shown many times the “As Above So Below” phenomena in relation to earthquake volcanic on earth ..
SS: NASA said this comet is very small being only 1.5 miles across .. amazing that it shines so brightly as to be nakid eye visible in the night sky. Cold as Ice: X-rays from Comets Submitted by chandra on Thu, 11/04/2010 X-rays are usually associated with some of the hottest objects in the Universe and exotic matter — black holes, neutron stars and the like. It is one of the wonders of the universe that, pound for pound, a dirty snowball may outshine them all! At a press conference on Thursday afternoon, mission scientists discussed their first impressions. The comet has a dumbbell shape, they noted, with rough ends and a smooth middle. The rough terrain seems to be the “land of jets,” with geysers spewing from many specific topographic features. The middle, on the other hand, is relatively smooth and quiet. It is covered with some kind of fine dusty material that seems to have collected in a broad topograhical low point. 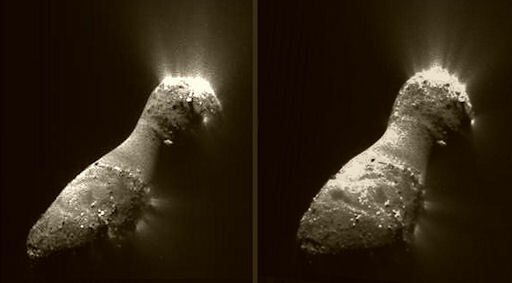 Researchers expressed their continued amazement at Comet Hartley 2’s hyperactivity. The comet is absolutely bristling with gaseous jets even on the comet’s nightside where volatile ices are shielded from solar heating. 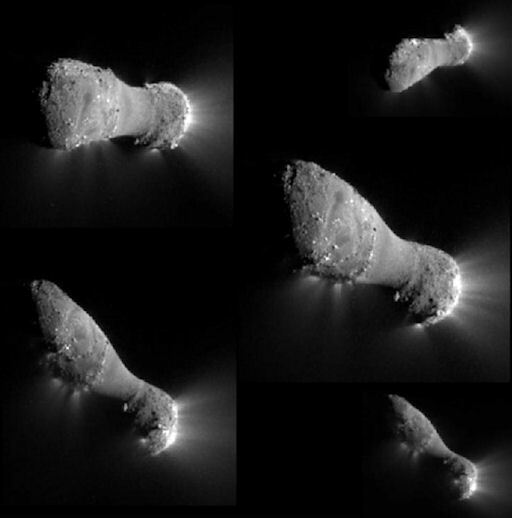 They also noted distinct lines of jets tracing the comet’s day-night terminator, a phenomenon never seen before. Stay tuned for updates as the analysis continues. 3D BONUS: Spaceweather.com reader Hanno Falk combined two of the comet photos to produce a semi-stereoscopic pair. Cross your eyes to merge the nuclei and scan the 3D terrain: “The two images I combined were not ideal for this purpose,” says Falk. Nevertheless, they produce a fairly strong 3D effect. Better 3D views will become available after a full set of flyby images have been beamed back to Earth. SS: priestess is a genuine beehive queen .. she wears the beehive crown . in the map below we see the lemurian ippissimus priestess beehive queen . this is a reflection of priestess “soul of earth” etched into the planet along with other i describe in map below . SS: i discovered the priestess reflection few years ago and just recently discovered who priestess was when holmes* exploded megaburst in the astral above just as @britneyspears released her BLACKOUT album in october 2007 .. it was a little more complicated than just the album holmes* this rare comet event i discovered and marked priestess queenBee .. britney . and to be this holmes* priestess she would have to been this before she were even born . Ipsissimus (10°=1□): Beyond the comprehension of the lower degrees. An Ipsissimus is free from limitations and necessity and lives in perfect balance with the manifest universe. Essentially, the highest mode of attainment.